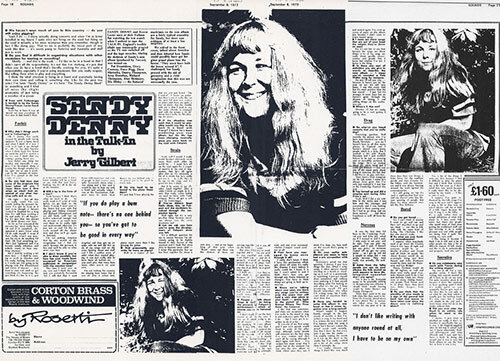 Sandy Denny and Trevor Lucas were at their Fulham flat watching the test match when I arrived to tape the talk-in. England’s terrible plight was temporarily averted as the TV was switched off and the tape recorder, blaring the skeleton of Sandy’s new album (produced by Trevor), was turned on. Pat Donaldson, Gerry Conway, Dave Pegg, Dave Mattacks, Danny Thompson, Jerry Donahue, Richard Thompson, Alan Skidmore, Diz Disley – the featured musicians on the new album – are a fairly typical assembly for Sandy, but there was evidence of at least a few surprises. We retired to the front room, talked about America and then debated how Sandy could possibly have got her giant grand piano into the house. “They must have built the house around it,” I challenged, but Sandy proved with the aid of geometry and a vivid imagination that this was not necessarily the case. We haven’t seen much of you in this country – do you still enjoy gigging? Do you find it difficult in organising situations with other musicians for touring or recording? “Ideally – and this is the truth – I’d like to be in a band so that I didn’t carry all the responsibility. It’s not that I’m shirking, it’s just that when you do have a band that’s literally working for you, it’s quite a responsibility especially if you’re using musicians that you really respect, like telling them what to play and everything. Even with Fotheringay it tended to be the Sandy Denny/Trevor Lucas band, though. Why didn’t things work out in Fotheringay? “Oh, I dunno. I’m easily swayed by people with strong opinions. It was a funny band and when I think of it now I wish we’d kept it up, though it’s silly to say that, because when I think back I’ve learnt an awful lot and I’ve written a lot too, and I think that my writing’s getting better. Do you feel now that some of the pressure has been taken off you? I mean there was a time when so much was expected of you after topping polls and so on. “Oh, right – but all that was really weird. I’m constantly feeling the pressure because I’ve got to keep at it, and even though I haven’t worked in England for a long time I’ve still been working a lot and really it’s all happening, it’s just that one doesn’t hear about it always over here. As far as I’m concerned the pressure has never really been off, and if it completely disappeared I don’t know what I’d do with myself. I mean, if there really wasn’t any pressure for me to do anything I’d think, ‘Oh God something terrible’s just happened and I’ve become totally talentless and nobody wants to hear anything anymore’. Will it be in the form of a tour? “Yeah, because I think that’s what we need to do – we really need to do a lot of work before we go back to the States. I mean, I went over to the States last year with Pat playing and Timmy (Donald) and Richard (Thompson) and we did fairly well, but we hadn’t rehearsed enough and the pressure is so much more over there to be really tight and professional, otherwise it’s just not on, and I’d like to work around all the places here and then we’ll go again to America. I don’t know if you’re able to draw parallels, but how has your music been accepted by American audiences in comparison with the reaction here? “This time I went over on my own, and I think the reaction was extremely favourable. But I still feel that I work better with musicians and a lot of people in their reviews were quite favourable about what I was doing and a few said it would be nice to hear me with a band. And actually, when I was at the Troubadour, Fairport were in town (Los Angeles) and they got up on stage with me and did five or six of my songs and we did some looning about and stuff and I felt a sudden sense of relief when they started playing. It was just really nice to have them all behind me – you can’t play that many bum notes when you’re on your own. Do you tend to be bound to the piano these days? And presumably you write far more on piano. If the piano situation was such that it could be possible, would you like to be back in a band with Trevor? I know he’s been producing your new album, but his life has been changing musically since you went back on the road with Fairport. “Yeah, well I would, I really would because obviously we’re away from each other an awful lot – I mean, he’s off on the road again for a couple of months at the end of September, then he’s off again after that, so it’s obviously a bit of a strain. But he’s really got into it – he really likes to be up on the stage and it’s good for him, I think. You’ve always been fairly close, too, to Fairport and the musicians involved through the respective bands. Let me ask you how you’ve seen the development of Fairport since you left. “It’s a difficult question for me to answer because I’m obviously going to be slightly biased in favour at the moment and I think that since they’ve become more solid – I mean this particular lineup has been together for about a year now – and at the beginning of that year when Rosie came out there was this element of them not staying together and it was all on the brink of disaster. But since then they’ve stuck together and had this one goal to stay together, really work hard and try and to do it properly instead of looning around all over the place. And I think because of their tenacity they’ll probably be a good band again. How have you managed to keep sane through it all? Since we’re talking about your past, are there any songs you’ve written over the years that still hold a very dear place in your heart – going back to the period of ‘Who Knows Where the Time Goes’ for instance? “I like that one sometimes, and there are occasions when I’m really in the mood to sing it and audiences quite like it if I do – but I can’t get it together to do it a lot. Have you tended to write this album in one burst or has it come together over a long period? “What’s tended to happen, funnily enough in the last couple of months, is that I’ve written a song in my head and I’ve written the tune down and I’ve known what the song is about, but I haven’t written the actual words until recently. Not that I don’t do that every time I go into the studio – I’m usually writing the words as I run up the street to the studio but I’ve really worked on a lot of the songs more than I normally do. I mean, are there any songs that are out of your head the minute they’re down on wax? Is there any sort of definition you can give in words to describe the new album? I mean, you’ve recorded a Fats Waller song for instance. So who’ve you heard recently that you’ve really dug? “Interesting question. Well recently the person who I’ve been most knocked out with is Randy Newman… you see, I haven’t been to all that many places in England and I haven’t heard very many people, which is a drag. But I worked a lot with Randy Newman and I just couldn’t believe it; he was so amazing and so incredibly pertinent in his songs. He’s so cynical about the whole thing and I really got amazed – that was one of the nicest parts about being in America, the fact that I did five or six gigs with him. “Yeah. Well, I did a gig with him in the States and I met him and his manager and everybody and I was looking forward to them coming over. So I had to go along and see them anyway… and Steve Goodman as well, all from the stable. Aside from the folky people you use on your albums, the folk revival as such appears to have disintegrated somewhat, don’t you agree? “Yes, it has a bit. Everyone seems to be gradually retiring or disappearing into oblivion. I should think worth hearing would be John Martyn and Danny Thompson. There don’t seem to be any folk clubs like they used to be. Since the Cousins closed down it was almost like a nucleus was taken away for some reason, for one part of it. In those days there was always a John Snow for the tradition people and then Cousins for the folkies with the harmonicas and it has always buzzing around, the trads against the contemporaries. So what are your fondest remembrances? “I suppose when everybody used to go down the Cousins when it was open all night and everyone would be on – Martin (Carthy) and Swarb and all kinds of people like Alexis Korner would do an overnight thing and Bert Jansch and John Renbourn would be there and the Watersons and Les Bridger. Do you think that the placidity of your music is a sign of the general laid back feel that seems to have taken over since the days you’re talking about? “Yes, a lot of the things I write are slow, because I find it difficult to play the piano fast and I think that restricts me a bit, but even so I don’t mind that very much because I really don’t like to be disturbed by my music – I like to take it easy. I suppose I’m quite influenced by the folk songs I’ve sung in the past, and I suppose I sing a bit in that way so you’d always call me a kind of a folk singer because the way I sing is a bit folky – it’s a style rather than an actual definition of what folk music is. I love some folk tunes but there are people who spend most of their time getting the traditional stuff out and reviving it in a really pleasant way and while people are doing that I quite like writing my own stuff. Do you collaborate very much with Trevor during the writing stages? Did you ever miss Joe Boyd in an artistic role when he went to the States?